Why does a claim get denied by insurance in the first place? There are countless reasons that a claim may be denied by an insurance company. With such an extensive list of denial reasons, it can get hard to keep track. 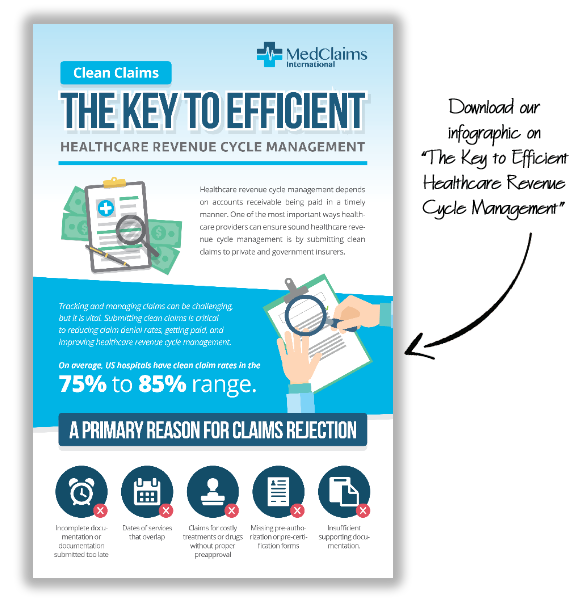 Ensuring that you are submitting clean claims can help to reduce the amount of denials that your organization sees up front. Click here to learn more about denied claims and download our infographic full of helpful industry statistics. So, what are the different types of denials? There are various types of denials but one of the most common is Medical Necessity. Essentially, a Medical Necessity refers to a treatment that a patient received that does not meet a certain level of severity to be considered medically important enough to warrant that treatment. Q: How can a denied claim get overturned? A: Partner with an experienced vendor. When working denials in house, your staff may not always have the necessary knowledge required to overturn a claim. An experienced partner will. Your denials management partner likely has seen the same type of denials before - they know how to get them overturned quickly and efficiently. A third party denials management partner will have the necessary time and resources to commit to get a claim overturned - time that your team can now allocate somewhere else. Insurance denials aren't going anywhere. In fact - they're increasing. The global healthcare claims management market is expected to reach nearly $14 billion by 2023. This growth is due to several different factors.